Capture all the fun of the seaside with the Pink Maxi Shell Set. 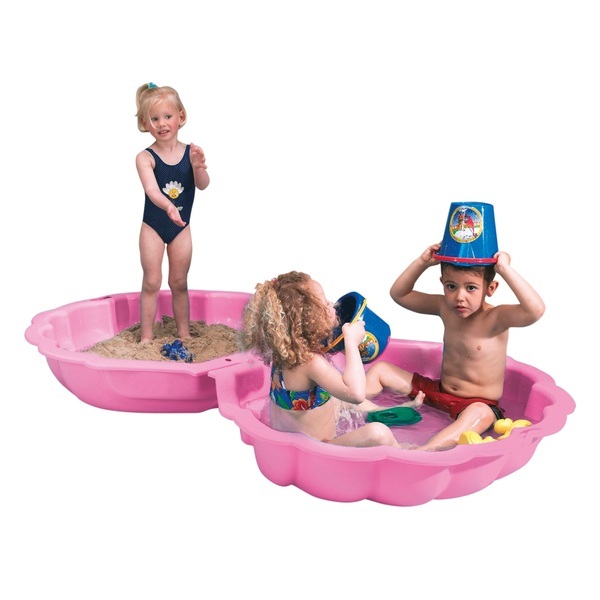 This fantastic outdoor set lets you create your own sandpit and paddling pool for fun in the sun. Simply fill one shell with sand (sold separately) and the other with water to make your own backyard beach. Or fill both shells with water for twice the splashing fun! Little ones will love cooling off on summer days with the Pink Maxi Shell Set. Sand and water play is great for sensory and tactile development, providing children with new textures to explore. Whether your child is a wizard building a magic world of water ways, a pirate hunting for their treasure or simply imagining a family trip to the beach, the Pink Maxi Shell Set is sure to encourage creativity and role play fun. 15kg Bag of Playsand (Ref: 100262/157399), sold separately. EU Warning: Always cover the sand pit when not in use and regularly check sand for sharp objects. Adult supervision recommended at all times.